A flyer for Continental Sports Cars by Bill Boddy, 1951/1952. Homepage. 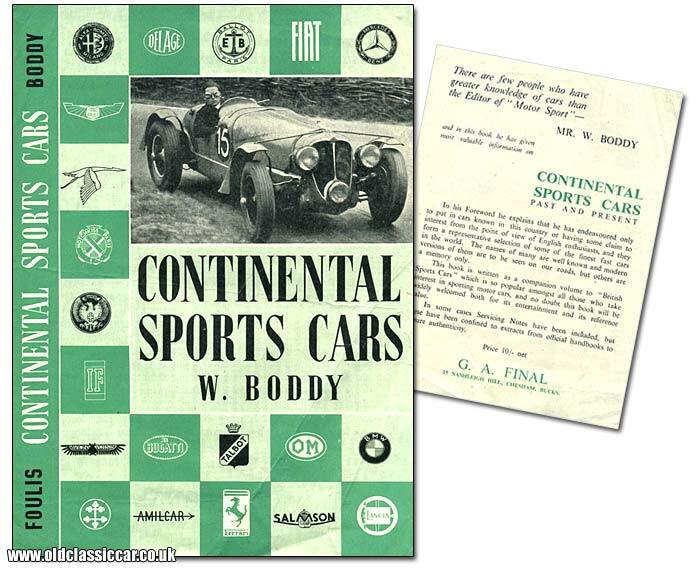 This page: A single page leaflet publicising the launch of a new book by W. Boddy about sports cars. Bill Boddy MBE has been around sports and racing cars for longer than most, and has been involved with Motor Sport magazine for decades - he was Editor of that fine journal from 1936 to 1991. This single sheet flyer, dating to 1951, was printed to publicise his new book due to be published by Foulis. Titled "Continental Sports Cars", it features on its cover a Delahaye being driven with gusto, in the days before crash hats became compulsory at race meetings. Badges from continental sportscars surround the Delahaye on the cover, these include marques such as OM, Delage, Alfa Romeo, Ballot, Hotchkiss, Isotta Fraschini, Voisin, Salmson and Bugatti. In his Foreword he explains that he has endeavoured only to put in cars known in this country or having some claim to interest from the point of view of English enthusiasts, and they form a representative selection of some of the finest fast cars in the world. The names of many are well known and modern versions of them are to be seen on our roads, but others are a memory only. This book is written as a companion to "British Sports Cars" which is so popular amongst all those who take interest in sporting motor cars, and no doubt this book will be widely welcomed both for its entertainment and its reference value. In some cases Servicing Notes have been included, but these have been confined to extracts from official handbooks to ensure authenticity. More items of a general motoring nature can be found in the Motoring Collectables section.